Araştırma, 2014-2015 Türkiye süper ligi futbol sezonunda oynayan profesyonel futbolcuların spor yaralanmalarını tespit amacıyla yapılmıştır. Çalışmada Fysion Blesreg anket formu kullanılarak 2014-2015 Türkiye süper liginde profesyonel futbol oynayan 469 futbolcu dâhil edilerek, anket formunu dolduran sporcular, doldurmayanlardan ise masör, fizyoterapist ve doktor kayıtları alınarak yapılmıştır. Araştırma kapsamında çalışmaya katılan sporcuların toplam 2675 yaralanmaya maruz kaldığı ve bu sporcuların genellikle birden çok yaralandığı tespit edilmiştir. Söz konusu sezonda (2014-2015) yaralanma sıklığı olarak sporcuların %51’i 3-4 defa ve sporcuların en çok % 42.2 ile II. bölgede yaralandığı görülmüştür. Yaralanma nedeni olarak kendi takım arkadaşı % 48.6, rakip teması ile % 43.5 ve malzemelerin neden olduğu yaralanma ise % 7.9’dur. Yaralanmaların önlenmesinde antrenman ve maç öncesinde yeterli ısınma ve streching egzersizlerine önem verilmelidir. Yaralanma sonrası antrenmanlara dönüş testleri yapılarak antrenman programları antrenmanların yapılacağı zemine göre doğru antrenman tekniği, antrenmanın süresi, sıklığı ve şiddeti göz önüne alınarak hazırlanmalıdır. The research was conducted in order to determine the sports injuries of professional soccer players in the 2014-2015 Turkish super league football season. In the study, 469 football players who played professional soccer in the 2014-2015 Turkish soccer league were included by using the Fysion Blesreg questionnaire and the athletes filling the questionnaire and the masseur, physiotherapist and doctor were taken from those who did not fill the questionnaire. It was determined that a total of 2675 injured athletes participated in the study and that these athletes were often injured more than once. As a result of this, 51% of the athletes were injured 3-4 times in the seizure period (2014-2015), and the athletes were injured in the II region with a maximum of 42.2%. The cause of the injury is 48.6% of his teammate, 43.5% of the opponent base, and 7.9% of the injuries caused by the materials. Prevention of injuries should give importance to adequate warming and streching exercises before training and match. After returning to post-injury training, training programs should be prepared by considering the correct training technique, duration of training, frequency and severity according to the level of training. Açak M., & Karademir, T. İşitme engelli futbolcuların yaralanma insidansı. 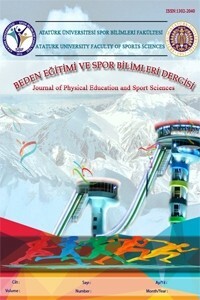 Spor ve Performans Araştırmaları Dergisi, 2012;3(1). Adamczyk G, Luboinski.L. epidemiologia of football, related ınjuries part ı. Acta Clinica, 2002; (2);236-50 . Arnason A, Sigurdsson SB, Gudmundsson A, Holme I, Engebretsen L, Bahr R. Risk factors for injuries in football. Am J Sports Med,2004;32:S5-16. Bağrıaçık A, Açak M. Spor Yaralanmaları ve Rehabilitasyon. İstanbul: Morpa Kültür Yayınları Ltd. Ş, ,2005; 14. Bayraktar, B., Dinç, C, Yücesir, İ., & Evin, A. Injury evaluation of the Turkish national football team over six consecutive seasons. Turkish Journal of Trauma & Emergency Surgery,2011;17(4), 313-317. Bruijn J V, Keizers. S. Sports injury registration: the fysion blesreg system. British Journal of Sports Medicine,1991;25:124-8. Chomiak J, Junge, A, Peterson, L, Dvorak, J. Severe injuries in football players. Influencing factors. American Journal of Sports Medicine, 2000; 28; 58-68. Cromwell F, Walsh J, Gormley J A. Pilot study examining injuries in elite Gaelic footballers, British Journal of Sports Medicine, 2000;34; 104-12. Ergün, M., Denerel, H. N., Binnet, M. S., & Ertat, K. A. Injuries in elite youth football players: a prospective three-year study. Acta Orthop Traumatol Turc,2013; 47(5), 339-346. Ergen E. Ankara :Spor Hekimliği, Sporda Sağlık Sorunları ve Sakatlıklar, 1986; 20-5. Fuller CW.Ekstrand J, Junge A, Andersen TE, Bahr R, Dvorak J, et al. Consensus statement on injury definitions and data collection procedures in studies of football (soccer) injuries. Clin J Sport Med,2006;16:97-106. Gustafsson R, Hodson A. Football medicine in the team. In: Football Medicine. Ekstrand J, Karlsson J, Hodson A eds. Revised ed,2003; p.11-39. Hägglund M, Waldén M, Bahr R, Ekstrand J. Methods for epidemiological study of injuries to professional football players: developing the UEFA model. Br J Sports Med,2005;39:340-6. Hawkins RD, Hulse MA, Wilkinson C, Hodson A, Gibson M. The association football medical research programme: An audit of injuries in professional football. Brit J Sports Med,2001;35:43-7. Hoy K, Hellelan HE, Lindbad-Terkelsen CJ. European soccer injuries, a prospective epidemiologic and socioeconomic study. Am J Sports Med, 1992; 20:318-22. Jorgensen U. Epidemiology of injuries in typical Scandinavian team sports. J Sport Med, 1984;18:59-63. Maehlum S. Football injuries in Oslo: A one year study. Brit J Sports Med, 1984;18:186-1. Ozdayi N.,Ugurlu F. Spor, Egzersiz ve Antrenman Bilimi,2015; Cilt 1, Sayı 1, 31-39. Powell J.W. National injury/illness reporting system: Eye injuries in college wrestling.Int. Opht. Clin,1981;21, 47-58. Rahmana N, Reilly T, Lees A. Injury risk associated with playing actions during competitive soccer. Brit J Sports Med, 2002;36:354-9. Reilly, T. Science and Soccer. Ed. E & FN SPON. London: Chapman & Hall,1996;25 – 64. Woods C, Hawkins R, Hulse M, Hodson A. The Football Association Medical Research Programme: An audit of injuries in professional football-analysis of preseason injuries. Brit J Sports Med,2002;36:436-41. ISNAD BAYER, Ramazan , AÇAK, Mahmut , KORKMAZ, M.Fatih . "TÜRKİYE SÜPER LİGİ TAKIMLARININ 2014-2015 SEZONDA GÖRÜLEN YARALANMALARIN DEĞERLENDİRİLMESİ". Beden Eğitimi ve Spor Bilimleri Dergisi 19 / 2 (June 2017): 29-38.